A new ad from Legal Sea Foods urges people to convert to a religion whose members are “pescatarians” — part of an eccentric new marketing campaign. Pescatarians’ diets include sea creatures but no other animals. Legal Sea Foods advertisements have insulted MBTA employees, referenced “Brokeback Mountain,” and likened the word “chain” to a four-letter expletive. Now, a new campaign from the Boston company attempts to establish a new religion whose members will be known as “pescatarians,” comparing them to Catholics and Presbyterians. A pescatarian is a person whose diet includes seafood but no meat. Legal Sea Foods is known for eccentric and sometimes controversial ad campaigns that push the envelope, compared with more traditional advertising. Most notably, snarky comments about the Green Line in ads seven years ago offended some MBTA workers. DeVito/Verdi, Legal’s longstanding New York advertising firm, said the new campaign, starting this month, is meant to make people laugh. This time around, they don’t expect to offend anyone. Say what you like about Roger Berkowitz, but don’t tell the owner of Legal Sea Foods he's running a chain of restaurants. Ellis Verdi hopes the campaign rallies pescatarians everywhere and, in turn, draws attention to the business. 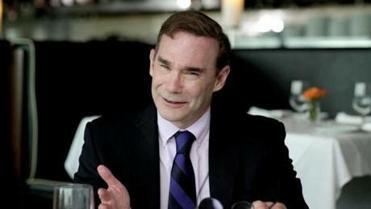 Berkowitz said that it is the widest-reaching Legal Sea Foods campaign to date, spanning all forms of media. Television advertisements, which begin airing next week, feature stock video of peaceful waves rolling onto a beach, high mountains, clouds, and a prairie with the sun beaming in the distance. A male voice-over says catch phrases like “In our book, gluttony isn’t a sin. 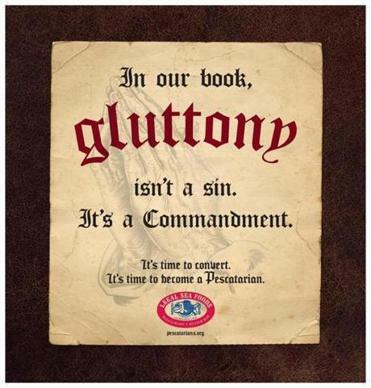 It’s a commandment.” The ads end with a call to become a pescatarian. A gag website for the would-be faith lists famous pescatarians (“Noah, probably”) and lays out the religion’s creed to spread its beliefs, shun imitation crab meat, and eat fish and seafood at all times.